While stumbling on the internet I found a remarkable piece of news that I wanted to share. 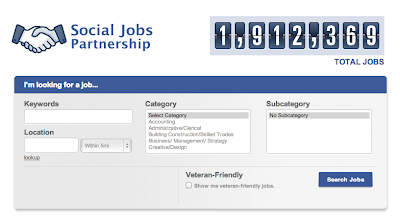 Do you know about "Facebook Social Jobs" ? Association (DE), and the National Association of State Workforce Agencies (NASWA). They show jobs provided by five big names in the hiring and recruitment area. (Work4Labs, BranchOut, Jobvite, US.jobs, monster). The partnership talks about an app, a facebook app that helps people find jobs provided by the recruitment network members of this partnership. It's still an app ,inside facebook, and it's not a standalone solution separate from facebook. Shall LinkedIn worry about It ? Some analysts say that LinkedIn is about 3 years ahead of market in the area of Enterprise hiring. Many many companies post jobs on LinkedIn. And the geographic distribution of LinkedIn opportunities is far better than this facebook app. All the signs are for the favor of LinkedIn. But there is one important thing, Facebook already has more than 1 Billion users. So this app can grow really fast and this can accelerate the market and let them catch LinkedIn within a year or so. What's your opinion, is it a fad or it's a game changer ?